Advertising Age has an article this week in the print edition about hospitals, advertising, marketing and social media, and relates it all to health reform. I was glad to get to talk with the writer, Rich Tomaselli, last week to discuss some of the things we’re doing at Mayo Clinic, and our philosophy relating to social media. Rich had said the article would run either this week or next, and so I was glad when Jane Sarasohn-Kahn (@healthythinker) alerted me to it with her tweet linking to her blog post about it. I think both Rich’s article and Jane’s post are good and make some valid points, and commend them to your reading. Quotes in mass media (like magazines, TV or radio) are always taken out of context. That’s not a criticism, it’s just a reality. Space and time are limited and expensive. Rich and I talked for about 15 minutes, and it was a great conversation. I’m sure he likewise had good talks with the others he quoted (and he did incorporate elements of our interview in his narrative.) There’s no way all of that is going to fit in a print article. One of the benefits of social media, however, and why these tools are so powerful, is the opportunity they afford for more in-depth content and discussions. They provide a way to get more in-depth information to (and feedback from) people who are interested. Given the fact you’re reading this, you must be one of those interested ones, when the topic is advertising, health care or social media. So here is some of the context of my conversation with Rich, and some reaction to the messages I saw in the article. First, I’m quoted as saying “social media is the way word-of-mouth happens in the 21st Century” which is true and accurate, but the real point, and what I emphasized in the interview, is the continuity of social media with how Mayo Clinic’s reputation has been built over the long term. For more than 100 years, the number one way people have found out about Mayo Clinic is through the recommendation of a friend or family member. It’s also consistent with Thesis 1, that social media are as old as human speech. It takes information PLUS a “life moment” PLUS a “care connection” to a friend or loved one to deeply engage in health. Paying for advertising (information) to be sent to a broad, undifferentiated group of people who aren’t currently experiencing the “life moment” or “care connection” is an iffy proposition. You’re paying to reach a lot of people who just don’t have a current need. This brings me to my other major observation, that the connection of all of this increased social media activity to health reform is significantly overstated. At Mayo Clinic, we have been involved in social media since 2005, starting with podcasts. We launched our Facebook fan page in November of 2007. We have been in Twitter since early 2008. We have been actively uploading videos to our Mayo Clinic YouTube channel for more than two years as well. And our Sharing Mayo Clinic blog for stories from patients and employees is nearly 18 months old. I believe health reform legislation is essentially a non-factor in the growth in social media adoption among hospitals. Instead, as I explain it in my 35 Social Media Theses, the reason hospitals are using social media is because this is the defining communications trend of the Third Millenium. Social media in health care is about much more than just marketing. As for the increase in advertising spending that’s being reported, maybe health reform is playing a role in that. It’s not really my area of expertise, so I don’t have a strong opinion on the matter. What do you think? Do you agree that increased social media interest among hospitals is essentially unrelated to health reform? What relationship, if any, do you see between health reform and the reported growth of spending on hospital advertising? A couple of changes made or announced this week suggest that “Like” and the associated thumb icons will become the standard for ratings. First, Facebook announced that it will no longer be using the “Become a Fan” lingo for users to indicate affinity for Pages. Instead of becoming a Fan of Mayo Clinic on Facebook, for instance, over the next few weeks you will be offered a chance to “Like” Mayo Clinic. Advertising Age has a good analysis of the implications. I think the article’s conclusion about what it means for organizations is right: it’s one thing to say you “like” an organization, and another to say you’re a “fan.” So we may see what Facebook now calls “connections” but they will be less of an indication of intensity of feeling. Which leads to yesterday’s significant change on YouTube. Among the other elements rolled out in the site refresh is a move away from the five-star rating to a simple thumbs up or thumbs down. 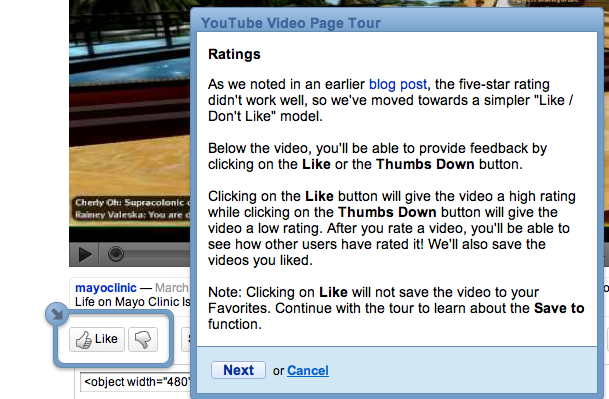 So they decided to just go with the “Like” or thumbs-down option. People who want to express themselves further can use the video comments, or if they want to indicate a stronger “Like” they can make a video a Favorite. What do you think of these changes in Facebook and YouTube? Do you “Like” them? Will you implement them in ratings on your own sites?